Like it or not, contemporary man is man-in-bureaucracy. He spends the majority of his waking hours in a bureaucracy; establishes an identity and status in a bureaucracy; garners most of his satisfactions and disappointments in a bureaucracy; and, increasingly, he is what he does. 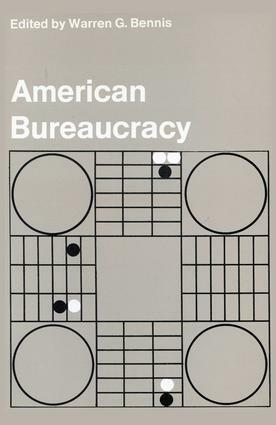 Aside from the importance of understanding those institutions that shape our values, behavior, and experience, bureaucracy is a vital area for study because it reveals a wide range of social behavior in a compact and comprehensible way. The abstract and ephemeral problems of society at large are brought down to earth —made measurable, comprehensible and visible in the bureaucratic microcosm. Problems of power and influence, change and innovation, intergroup conflict, ambition and aspiration, self-realization versus participative democracy, technology versus humanism: all can be observed and analyzed in human organizations. This volume pinpoints the dilemma of present bureaucratic organizations: the conflict between the need to sustain innovation and bureaucratic drives toward rationality and stability. The essays it contains discuss specific human needs that bureaucracy must meet if it is to continue to attract talented people and takes a step into the future to analyze the kinds of organizations that may be expected to evolve as institutions seek more flexible use of human resources.